SpaceX recently announced it has signed the world’s first private passenger to fly around the Moon aboard its BFR (Big Falcon Rocket) launch vehicle. Details on who is flying – and why – will be revealed during a live webcast on September 17 at 6:00 p.m. Pacific. SpaceX in announcing the news notes that only 24 humans have ever been to the Moon in history and that nobody has visited since the last Apollo mission in 1972. Technically, this mystery person won’t actually be going to the Moon but rather, flying around it. Either way, it’ll be an unforgettable and historic ride for the lucky passenger. On Twitter, a user asked SpaceX CEO Elon Musk if he was the person in question. Musk responded with a Japanese flag emoji, suggesting the passenger is Japanese. 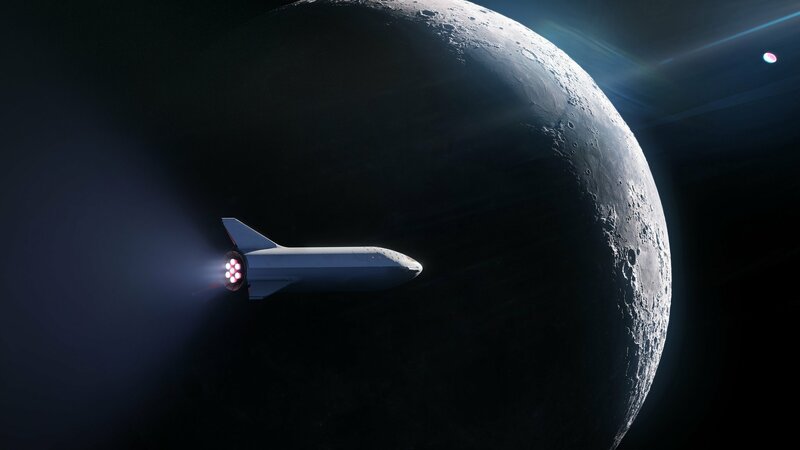 SpaceX’s tweet also included a render for a new version of the BFR vehicle. By the early 2020s, SpaceX hopes the BFR will replace all of its existing rockets and spacecraft. Musk announced in February 2017 that his company had enlisted two private citizens to fly on a trip around the Moon in 2018. Plans for that flight were eventually delayed; it’s unclear if one of the two passengers from that flight will be taking the trip on the BFR. I don't know.....virtually all the men that flew to the moon were world class pilots and navigators that had built up experience for decades in and around flight and space. Only one was not a career pilot by profession. They all had everything that would prepare them for a vast number of potential emergencies and eventualities. Not just on a technical level, but a mental and physical capability for reacting correctly and autonomously in that environment when your life was always on the line. Will the person that flies around the moon in such a venture be as capable or prepared in the event of problems? You would have to be. It's one thing sending paying amateurs sub orbital in a short flight, another putting people in orbit for a day or two, and completely off the charts sending them days and days out there around the moon and back. We shall see. It's no doubt carefully stage managed PR. Reehahs and wiyosaya like this. IMO, there is no doubt that it is carefully managed PR. It deflects from Tesla's problems, and gives people an ill-placed confidence that Musk is actually doing something when he is really not. Give it time, this will be walked back by Musk just like his satellite internet, Mars colony, supersonic electric plane that he says the world does not need, and who knows what else. IMO, it is prudent to be skeptical of virtually everything that Musk says especially with respect to future plans for any of his companies. The first astronauts (orbital not moon) were passengers in their 1960's craft so perhaps with modern tech it is possible to send a passenger around the moon. When I read a BFR going to the moon my first thought is that's going to take one Big Fuc*ing Rocket because Low Earth Orbit or even Geosynchronous orbit and going to orbit the Moon are very different things. Musk responded with a Japanese flag emoji, suggesting the passenger is Japanese. And the name is Kamikaze. Article states, "PASSENGER", they're just that, passengers. 1) Majority of the flight will be automated. 2) Professional team will be on-board. If you had read my post I think it was evident I thought about this precisely. Virtually everything on Apollo was heavily automated anyway. The astronauts programmed the computer, and the computer executed. This isn't a new concept for the 21st century, it was first done very nearly 50 years ago now on Apollo 8. My post implied indeed a passenger will need a professional trained crew and themselves would require serious training on procedures not performed by any astronaut for four decades. However it's the unforeseen that requires the experience and cool heads of career professionals. Any problems, each man of the Apollo crews could calculate trajectories manually and navigate, fly home executing a return and re-entry without assistance and land without comms over the course of several days. They understood exactly what it took to fly their flimsy space tin can. Any 'passenger' has to operate as part of the crew on a mission as significant as this, it's no joke. This isn't a jolly jaunt to Coney Island. As demonstrated by the crew of Apollo Thirteen.